"I have watched the police of this city, and I know that there are difficulties. I know that we have struggles, and we are here to help you work through those struggles in the way that will hopefully be the best and most productive way for this department. 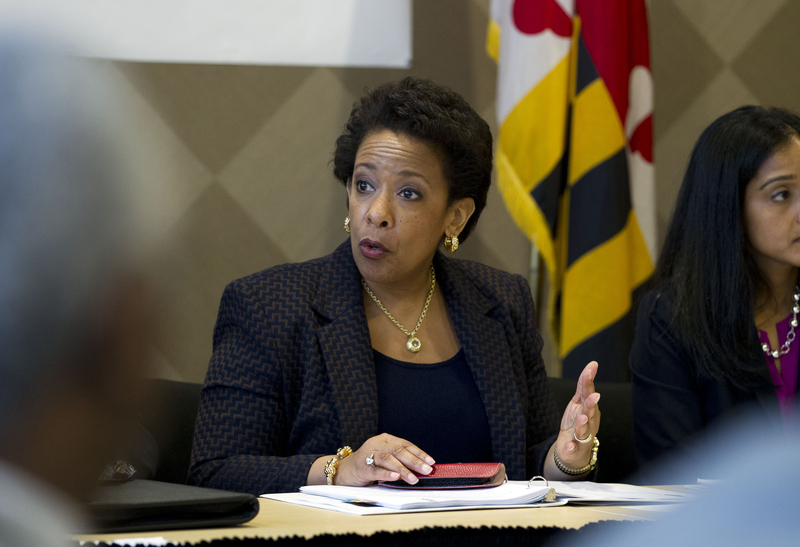 But to all of you who are on the front lines, I just want to say thank you," Lynch said Tuesday. "You really have become the face of law enforcement. Now you may say that's for good or ill, I know, but we don't always choose moments. Sometimes they choose us. And how we live with that and how we go through with that, determines what kind of officers we are," she said. In a meeting with Baltimore Mayor Stephanie Rawlings-Blake, Lynch said the people of Baltimore are "willing partners in the effort to improve this beautiful city." Lynch's biggest challenge as the top law enforcement officer in the country is striking the right balance between supporting the community while also supporting law enforcement. When former Attorney General Eric Holder traveled to Ferguson, Missouri after a black teenager was shot by a police officer, he was criticized for seeming to "tip his hand" too far. Lynch appears to be making a deliberate attempt to hear from both sides to avoid the same perception. "Separation is not an option. Divorce is not an option. We have to figure out how we're going to make this marriage work, make it healthy and make it thrive so that our city can thrive," she said.